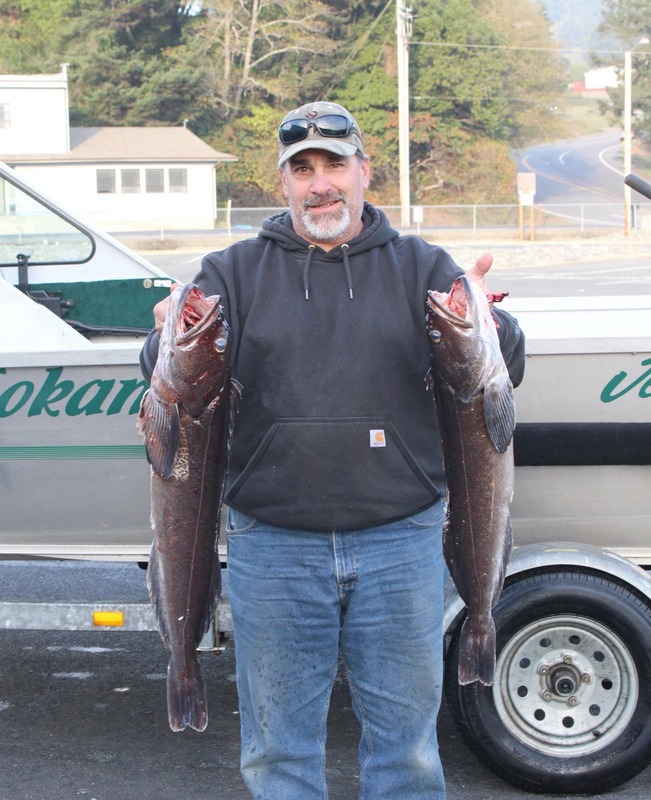 When Chetco bay trollers went 4 or more hours without a strike, they stuck gold in the form of big lingcod outside the entrance to the Port of Brookings Harbor in 40 feet of water or less. Photo by Larry Ellis. 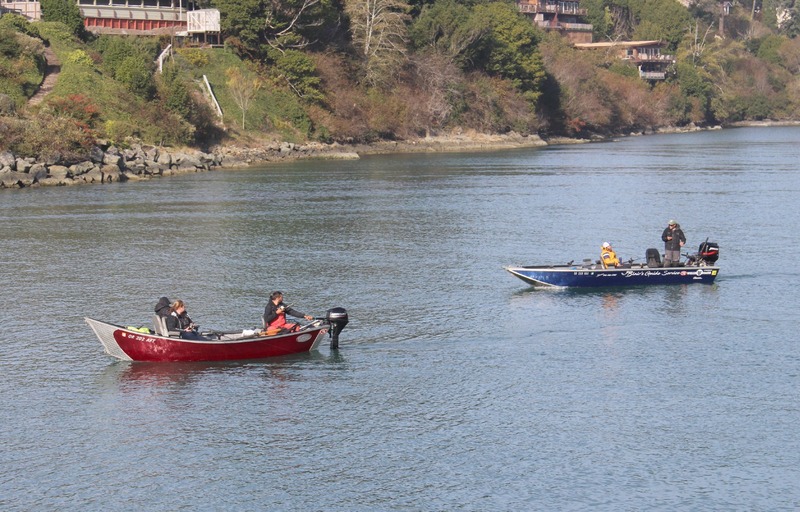 About 10 boats including drift boats and jet sleds continued to troll the Chetco bay in search of Chinook salmon. The action has been very sporadic, but predictable. Anglers have had better luck getting a savage take-down every other day. But, the main question that is puzzling most anglers is why the Chetco bay is spitting out king salmon in the middle of November. The answer is simply that there has been no rain to move the majority of the Chinook upriver out of their low-water tidal abodes, and hordes of wily kings have decided to take up camp in the estuary. Now, the action is not off-the-chart spectacular by any means, but anglers who have put in their time, time meaning two days in a row, have been averaging about 1 to 2 fish per boat. To further understand this season’s salmon bite, a person must become familiar with the habits of Chetco River kings. Typically, salmon enter the Chetco with gusto toward the end of October. I definitely remember days when it was raining cats and dogs in October, and salmon could be caught upriver using standard drift-fishing or plug-pulling techniques. I even vividly remember watching all the rollers, splashing their way up the sides of the river at Loeb State Park. Then, November rolled around when the river was flowing anywhere from 1,200 to 4,000 cubic feet per second. November was historically the time when you were going to tie into Chinook averaging 30 pounds and larger. As November started to end, the amounts of Chinook and their heavy sizes started to diminish as well. But you could always count on hooking up with a sizeable Chinook all the way through November. As December rolled around, the Chinook numbers that entered the river really started diminishing, and the bite slowed down considerably. It is important to note that the bulk of the salmon spawning always took place during the month of December as well. It’s not that you couldn’t hook up with a Chinook during this particular month, people just considered December to be a Bermuda Triangle month for Chetco kings. Occasionally, you could hook up with a chromer in December. But, the ones that you could get to bite were usually quite dark, showing that they were about ready to, or have already spawned. I remember December as typically being a month where you hoped to catch a winter steelhead, and the ones that you hooked were very aggressive, as the silver bullets were gobbling up single eggs floating away from the salmon redds as fast as they could. So, now it is officially the middle of November, a time of the year when anglers were cutting up filleted sardines and wrapping them around Kwikfish and FlatFish. But we cannot use these lures as they were intended to be used mainly because of one missing part of the equation. And there has been a lack of that one word that explains why anglers are still catching Chinook in the Chetco bay. The lure du jure is trolling spinnerbait-type setups, with a naked anchovy being my preference. It was also the preference of noted guide Shane Blair of Blair’s Guide Service who boated a 30-pound-plus salmon on Thursday. So, like I said in last week’s column, fishing in the Chetco bay should be steady until the first shot of fall rains come. There is a rumor rattling in the trees that the area is supposed to get some rain by the end of next week. But will it be enough rain to raise the Chetco? Unless several inches of rain hit the area for several days in a row, the ground will likely soak it all up like a sponge, since the ground has not yet reached its saturation point as of yet. Meanwhile, anglers fishing for bottomfish just outside the Port of Brookings Harbor have reported seeing some mighty big arches on their fish finders. Thankfully, there are still 14 days of November left that should be beckoning these arches to turn into rod-bending, thumb-burning Chinook. 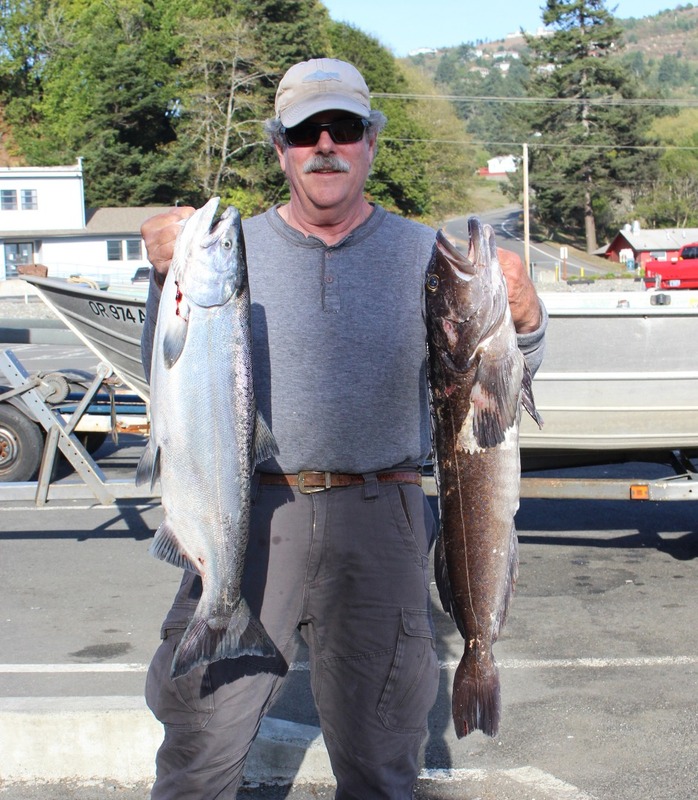 Meanwhile, plenty of anglers have enjoyed plenty of limits of rockfish and lingcod by fishing the reefs just outside the jaws of the Port of Brookings Harbor. Many discouraged salmon trollers have been getting limits of lingosaurs just outside the Port’s jaws. Remember not to be disheartened if you don’t hook up with both lings and rockies when you make your first drop. These fish are scattered throughout Davey Jones’ Locker. You just have to know where to find them. 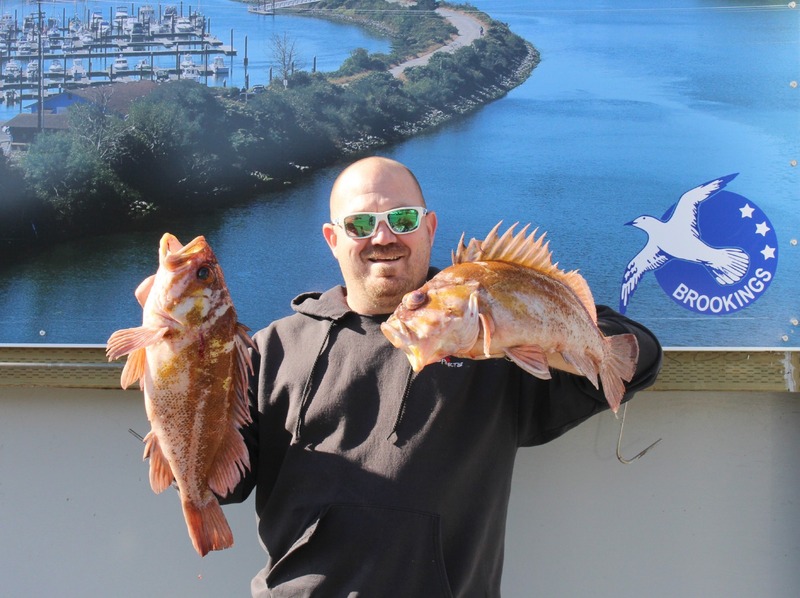 “We have had no problem in getting our clients limits of rockfish,” said fishing guide Andy Martin of brookingsfishing.com. Martin says that the lingcod have been spawning in shallower water. So if you find a rocky reef just outside the kelp beds, especially a reef that contains pinnacles, get ready to drop your soft plastic bait into a lingcod’s mouth. The larger females will be depositing their eggs inside these mountainous rocky crevices, and the males will be depositing their milt onto the eggs. Some anglers with smaller boats have been able to fish right inside the kelp beds to get their lings, places where larger boats would never consider going, even on a super-flat day. Drift boats handle the kelp beds quite well, as do 15-foot aluminum-type boats like Westerns, Gregors, Valcos and SmokerCraft Alaskans. The Rogue bay action for Chinook is considered to be over and done with. Very few anglers are holding out hope for the Indian Creek run of Chinook to show up. It is entirely possible that the Indian Creek fish are kegged up outside the Rogue River mouth, waiting for one big shot of rain to signal them to head upriver. Time will be the deciding factor on that one. So, if the water is calm, head up the beach where the sand meets the south jetty and fish inside that little indentation. Other good surfperch fishing spots are at Kissing Rock and at the Nesika Beach Wayside. Carey says that these surfperch bite all year long, not just in the stereotypical months of May and June. With no rain in the forecast, boaters continued to troll the Chetco bay last Thursday in the hopes of one solid take-down from a big king. Photo by Larry Ellis. 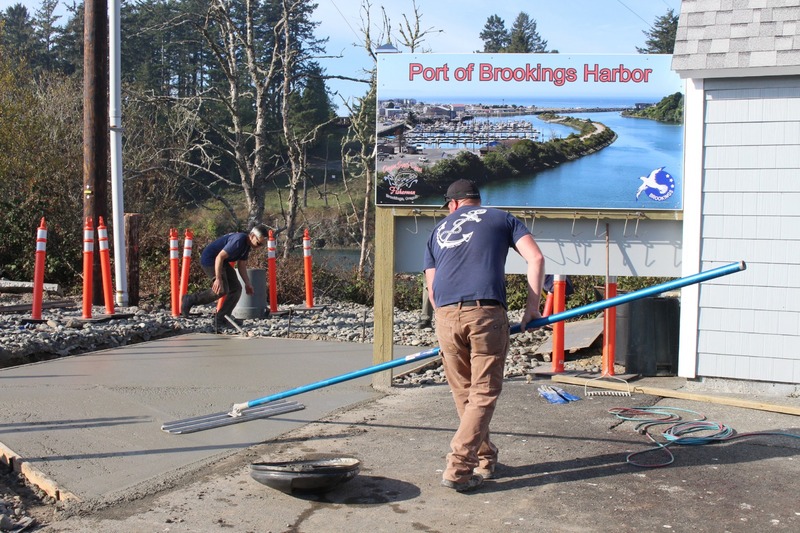 Employees of the Port of Brookings Harbor trowel off a cement pad, an addition to the cleaning station - a place where anglers can conveniently wash out and clean their ice chests. Photo by Larry Ellis.